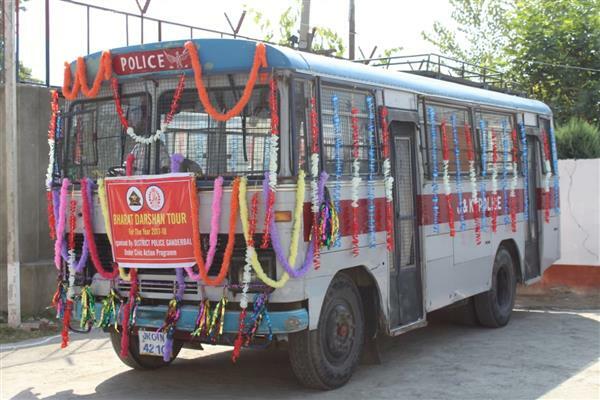 September 12 (KNO) : Ganderbal police organized Bharat Darshan Tour under Civic Action Programme (CAP) which was flagged off by DDC Ganderbal Shri Piyush Singla-IAS and SSP Ganderbal Shri Khalil Ahmad Poswal-JKPS from District Police Lines Ganderbal, today. This tour will provide them a new experience and also give them vast exposure to become more confident and attain knowledge about the visiting places, they said. Among others ASP Ganderbal, DySP DAR Ganderbal, DySP HQR Ganderbal and other officers and officials of District Police Ganderbal were present on the occasion.